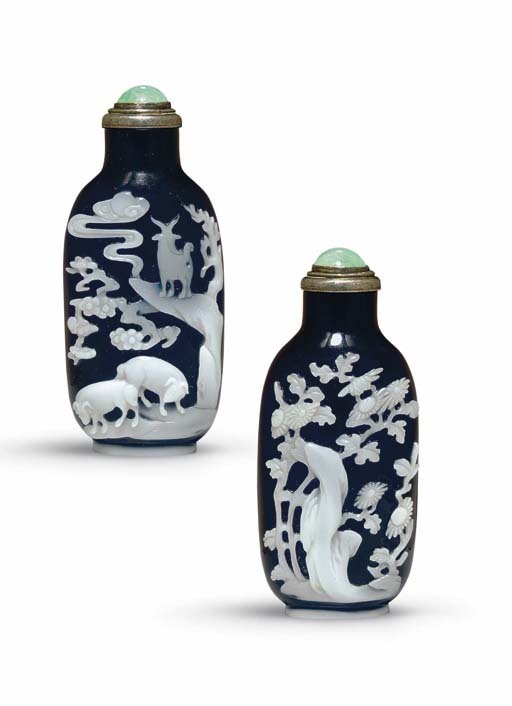 It is extremely rare to find a white overlay on dark sapphire-blue glass bottle, and the masterful and confident carving on this bottle sets this example apart as one of the most spectacular of all glass overlay snuff bottles. The three goats on one side are carved with great skill, the artist creating a sense of depth and perspective that belies the essentially two-plane carving. The three goats (sanyang) represent prosperity and renewal at the beginning of the year (sanyang kaitai), an idea reinforced by the sun (taiyang) on the horizon while the blossoming prunus has long inspired the literati with its fortitude in blossoming when snow is still on the ground. Flourishing in adversity, it became a powerful symbol of the Confucian scholar who strived to serve the best interest of his country despite whatever hardships he might encounter. Along with lotus, orchid and bamboo, the chrysanthemum is regarded as one of the "Four Gentlemen of flowers", and has traditionally been very highly regarded in China. Chrysanthemums are mentioned in such early classical literature as The Book of Odes, and are symbols of longevity and wealth as well as being the flowers representing autumn.